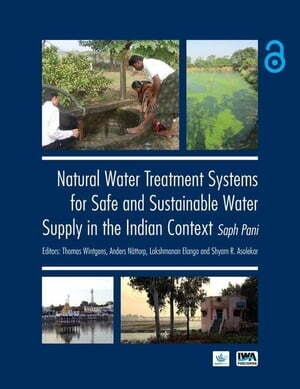 Collins Booksellers - Natural Water Treatment Systems for Safe and Sustainable Water Supply in the Indian Context: Saph Pani by Wintgens, Thomas, 9781780408392. Buy this book online. Natural Water Treatment Systems for Safe and Sustainable Water Supply in the Indian Context is based on the work from the Saph Pani project (Hindi word meaning potable water).The book aims to study and improve natural water treatment systems, such as River Bank Filtration (RBF), Managed Aquifer Recharge (MAR), and wetlands in India, building local and European expertise in this field. The project aims to enhance water resources and water supply, particularly in water stressed urban and peri urban areas in different parts of the Indian sub-continent. This project is co-funded by the European Union under the Seventh Framework (FP7) scheme of small or medium scale focused research projects for specific cooperation actions (SICA) dedicated to international cooperation partner countries.Natural Water Treatment Systems for Safe and Sustainable Water Supply in the Indian Context provides:an introduction to the concepts of natural water treatment systems (MAR, RBF, wetlands) at national and international levelknowledge of the basics of MAR, RBF and wetlands, methods and hydrogeological characterisationan insight into case studies in India and abroad.This book is a useful resource for teaching at Post Graduate level, for research and professional reference.